Treading on scrubbed wooden floor boards, into the clean well lit space there is an encounter with a series of turquoise hued paintings and an immediate sense the artist of those paintings adores playing with colour and the materiality of paint. 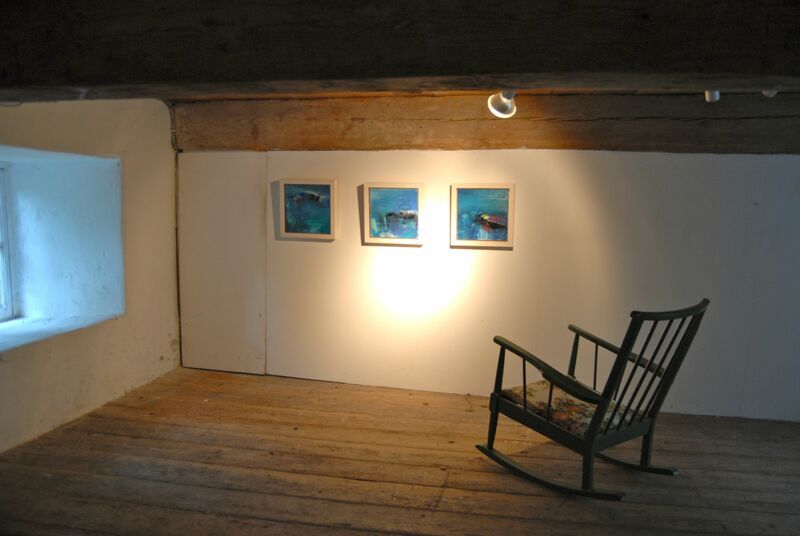 This was the setting of Serena Caulfield’s most recent exhibition of work titled “Root of an Unfocus” in the Berkeley Gallery at Grennan Mill, Thomastown, August 8th thru the 17th, during the Kilkenny Arts Festival, 2014. The gallery space is a charming building of antiquated origin which combines most effectively with the contemporary sleek body of work that Serena has completed. In fact, on one level before entering the main exhibition space, three of her paintings are in a setting with an old chair, a window nearby, which gives an indication of how well suited her art work is placed in an every day environment. It speaks of intimacy and familiarity. Lucy Lippard wrote in her book, “The Lure of the Local”, that a “lived in landscape becomes a place which implies intimacy; a once lived in landscape can be a place if explored, or remain a landscape if simply observed”. For Caulfield, a Wexford based Irish artist, this sentiment is most keenly felt and portrayed. The owner of a small, quirky gallery in a southern Wexford village, very near the sea, Caulfield clearly uses her locality and place as a springboard for this body of work. The images use rich layers of paint, deep physical mark making and a semi abstract response to the landscape which give a comfortable, settled appearance. A landscape or environment that is explored and not just observed. The knowledge of her locality is expressed in the various changing aspects of the sea, sky, and other physical objects she encounters while exploring this environment. The blocks of blue tones interspersed with the colourful brush marks are vaguely representational of that physical intrusion into Nature. While a majority of her work shows vast amounts of sky amongst the physical objects of the environment, two of her paintings take on a darker note. “The Voyage” done with acrylics on canvas has inky indigo colour with objects and paint marks to contemplate with the occasional trademark blotch of red hue she places in her art and “Where the cold wind blows and the wild things go”, has rich, deep navy blues with splatterings of paint as if one is looking out a window on a late evening during a storm, the drip marks reminiscent of rain against a glass pane. There are small paintings done with oil on Fabriano paper that can be clustered in a group for dramatic impact or left as a single strong image, mixed media on Fabriano paper in “A Prelude to Meditation”, acrylic on canvas, “ Second Home by the Sea”, oil on panel, “Some Kind of Nature”, or oil on canvas, “Stylo”. Whatever materials she chooses to employ for the work, all show a high level of skill inherent in the process of paint and the technical use of draftsmanship. Serena’s studio may well be the familiar strand of sand and sea she explores while walking, her artistic research is the local community that interact with her on those explorations, for as Lippard states in her book about place, “to hope for an art that grows from a deep experience with people and the places where they live” is the great expectation. One might observe that Serena Caulfield is well working her way towards fulfilling that expectation. Lippard, Lucy, 1997, The Lure of the Local; Senses of Place in a Multicentered Society, Pub: The New York Press.